Ah, Russia. The rest of the world can’t quite decide whether to fear them or laugh at them, just as it was in the 80s when Soviet villains in Hollywood flicks were alternately sinister and goofy. Americans don’t have a monopoly on the superhero film genre, as Bollywood blockbusters like Ra.One and Hong Kong’s Black Mask have proven. With Guardians, Russian filmmakers attempt to set up a superhero franchise that can go toe-to-toe with the big boys from the decadent west. Suffice it to say that Captain America can rest easy. As a result of military genetic engineering experiments during the Cold War, a Soviet government agency named ‘Patriot’ has created superhuman warriors. These include Ler (Sisak), whose geokinesis and terrakinesis gives him power over earth and rocks; Arsus (Pampushnyy), a were-bear; Khan (Madiyey), an enigmatic teleporting swordsman; and Ksenia (Lanina), who can turn invisible and transform her body into water. Over two decades later, these superheroes are called out of retirement to defend the world from August Kuratov (Shirin), a mad scientist who worked for Patriot and was turned into an unstoppable monster after a terrible accident. Kuratov possesses the Modul-1, a device which grants him control of any electronic equipment, allowing him to turn the military’s resources against them. With Maj. Elena Larina (Shkirando) at the helm, the Guardians must rediscover what it means to be heroes, as not just Russia but the whole world is threatened by Kuratov’s dastardly scheme. Even with the benefit of the doubt that the dialogue is terrible only because the subtitles are poorly translated, there’s just so much straight exposition that we’re bombarded with. Characters reel off their backstories in the most perfunctory way and our heroes are solely defined by their abilities. We come to appreciate elements we take for granted in most Hollywood movies, like functioning sound mixing. In Guardians, the soundtrack is way too loud in the mix. Transitions from scene to scene are often jarring. And for some reason, we get the same title card twice. This movie is broken and we can’t trade it in for a new one. Where the action sequences are concerned, at least Andreasyan is aiming for some level of ambition. He’s obviously gunning for a degree of spectacle possessed by films of a much larger budget, and it’s a slightest bit admirable that the effort is evident. The computer-generated visual effects are of a higher standard than those in contemporaneous Chinese films, but that doesn’t make them convincing. The helicopters, spider-like drones and crumbling buildings all look passable, but Arsus himself is hilarious. We had to resist humming The Bare Necessities when he takes on his final form, realising that would be a grave insult to the infinitely superior visual effects work in the recent remake of The Jungle Book. The performances are uniformly stiff, and everyone looks a mite too pretty – surely the feral bear-man should appear mangy and unkempt, instead of resembling Chris Pratt with a larger build. We’d call Kuratov one-dimensional but that would be an affront to straight lines everywhere. He made us almost promise to never disparage a Marvel Cinematic Universe villain ever again – almost. The characters in Guardians feel like they’ve been devised by struggling writers and artists desperate to break into the industry via an indie comic they’ve cobbled together with funds raised on Kickstarter, except those generally have much better characterisation than what’s on show here. Guardians might be ‘so bad it’s good’, but that doesn’t make it any good. It might become a cult favourite, with hipsters ironically proclaiming how much better it is than your average Hollywood product because it’s “so sincere”. And brace yourselves for the sequel, co-financed by China and featuring Chinese superheroes, because of course it will. Even if we didn’t watch this within a week of Logan, Guardians would still be a laughable train wreck. 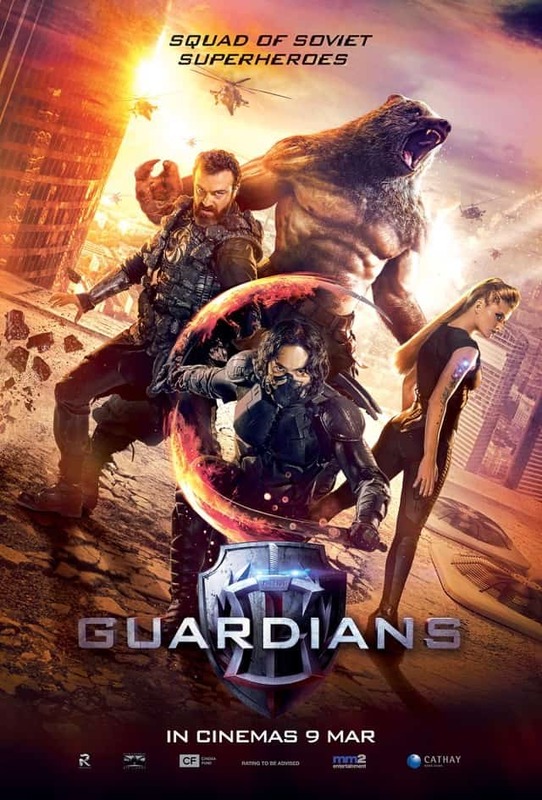 Summary: A chintzy knockoff inept in nearly every way, Guardians demonstrates that just because good superhero movies are a relatively common occurrence now, that doesn’t mean making one is easy.